But where is Dr. Senta Siller? Is she well? Ya, she is perfectly well. Busy on a new project in Germany. 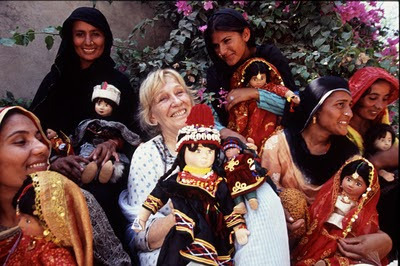 Teaching different handicraft skills to German women. You are a Queen of Dolls and hearts as you have won so many of them. It was about 12 years back that I came to Dolls Village and that became a special day of my life. The charm gripped me from the very entrance of the village. The doll’s house (vocational training centre) was a peaceful place with love and happiness abounding. I was directed towards a room whose furniture was a table of plain cement on which dolls, toys and art material was placed. A simple room with beautiful setting but the most beautiful moment was a lady standing up with a sincere smile and it appeared as if an angel has stood in front of me. That happiness I found all around the village. It’s indeed a model village and you are queen with the magic wand who transformed it all.